Enjoy our take on Carrot! 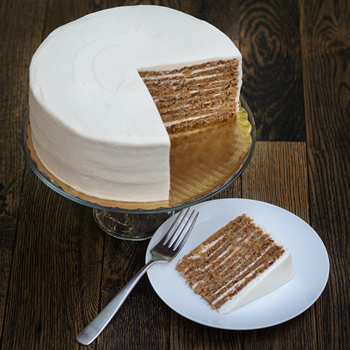 Each cake is made from scratch with real carrots, comprises layers of moist carrot cake and is frosted with a classic Smith Island cream cheese frosting. The cake is approx. 9" in diameter and 3.5" tall, and yields 14-16 slices. Like all SIBC products, it is shipped frozen with dry ice in a recyclable cake box. but can be ordered for delivery on/after Wednesday 01 May, 2019.